If you clicked over wondering why “Concert Review” precedes war on drugs verbiage then you probably never heard of the band. Conversely, if you clicked over knowing exactly what to expect then you’ve probably never heard of the once popular government campaign to crackdown on illegal drugs. Once you have two hit singles on the radio I tend to take notice. But the rest of the catalogue admittedly did not come across so smoothly. But that’s OK! It took time to digest whether that indicates my shortcoming as a listener or the band simply requires full immersion to appreciate. Yes, they do have some odd if not eccentric excerpts, if you will, that lengthen many of their songs often diverting from the fundamental melody. 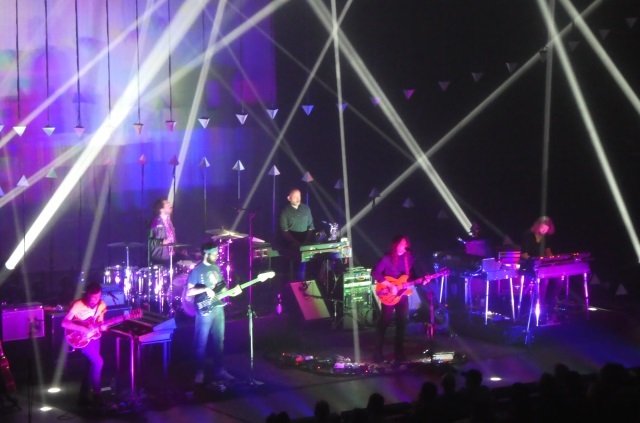 Regardless, their show on Friday at the Keller Auditorium in Portland, OR featured 17 songs over the course of two hours and 15 minutes as they stretched some of the numbers past 10 minutes in length – keeping the full integrity of the album version including those sometimes lengthy excerpts that introduce or close songs – while incorporating ripping guitar solos on others. The band hailing from Philadelphia started with “Brothers” and the popping “Baby Missiles” off Slave Ambient then followed with “Pain” the first cut off last year’s Grammy winning A Deeper Understanding and “An Ocean in Between Waves” – which was great live – the first from the popular Lost In The Dream . The War on Drugs touched all four of their albums in the first six songs as “Arms Like Boulders” was the only offering off Wagonwheel Blues. The War on Drugs wasted little time between songs playing almost non-stop as a number of tracks included the lengthy almost operatic instrumentals on the album version that sometimes meander and don’t always make a lot of sense on paper – or make that plastic (or vinyl) – but when served live, successfully accompany the primary melody and meat of the song while working as a transition from the previous song or for the following song. 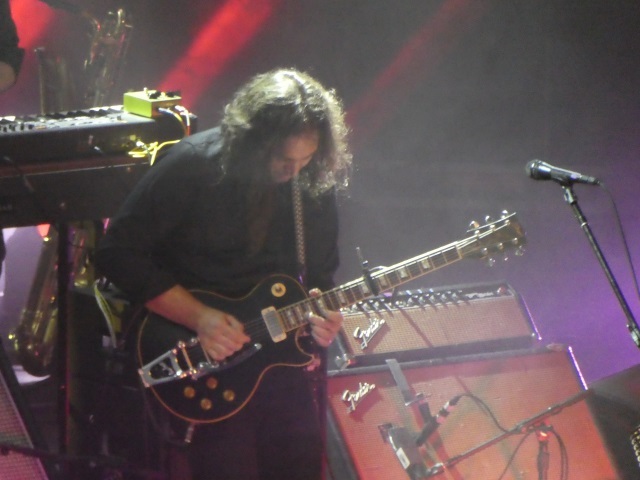 Singer and lead guitarist Adam Granduciel traded out guitars all evening, which sometimes helped identify a new song was brewing as the band kept notes flowing, and played some rock hard solos on most showing exactly why and how this band found mainstream success. Yes, they really know how to extend songs and unfortunately in some cases drag them out. “Under the Pressure” worked very well and if you’re familiar with the song know the difference between the radio edit and the nearly nine minute version off the album that features an extended epilogue as the band played the primary melody into a cool jam pushing the song past 10 minutes. But “Thinking of a Place” followed with a similar approach hardly employing the same results as the song doesn’t carry an up-tempo rhythm that pushes the momentum forward instead produced some yawn-inspiring ambient noise. An odd name for a band, no doubt. And so SEO unfriendly. (That means Search Engine Optimization – something I desperately try succeeding on every article here with minor success.) Seriously look up the war on drugs. Now look up Coldplay. But with four albums and a solid fan base the band has reached the top of the organic charts for most search engines and has displaced much of the legislative talk with something a bit more pleasant. Which by the way describes much, if not all of their music. Pleasant. Whether actively listening or passively, only taking notice during a lull in whatever activity consumes you. But don’t expect the laid back approach emanating from their albums to transcend to the stage. A sometimes dazzling light show carried on through the evening as Granduciel showed some wizardry on the guitar cranking out often chord shredding solos and in many respects carrying much if not most of the weight routinely stepping on foot pedals and breaking out the harmonica several times. However, it would serve the band and audience well if the mixing console was tuned appropriately. Not only was the sound loud and almost excessive, Granduciel’s vocals were sometimes lost, often hard to understand and even muffled. Occasionally, you could hear the crackling and static from the speakers – clearly one of the channels was way too hot. “Nothing to Find,” “Pain,” “In Chains,” “An Ocean in Between the Waves” and of course “Red Eyes” and “Under the Pressure” all factored into a well-played evening by Granduciel who was backed by five other musicians. But, the Warren Zevon cover “Accidentally Like a Martyr” just didn’t flow well and perhaps the band should rethink some of those protracted exercises in musical endurance that turns a four minute song into a lengthy daze. Granduciel lost his co-founder Kurt Vile 10 years ago after the band’s debut album Wagonwheel Blues and a host of lineup changes followed but he continues with the War effort which led to three more albums, a Grammy for the last album and a growing catalogue of songs that help define today’s popular music while embracing the tone and texture of the influencers that were around for the original war on drugs. The audience was a bit sparse and hardly a sell-out though a far bigger venue than the Doug Fir – a small bar and stage setup beneath a restaurant that mostly accommodates standing – the band first visited seven years ago as an opening act. The upper balcony was empty of the nearly 3,000 seat Keller and the middle balcony was just more than half filled. But give it time, as the War on Drugs continues expect the word of mouth that often follows the authentic live performances of many bands to only grow stronger. Just fix that sound. Note: Thanks to the digital age I am not 100 percent on the setlist. Gone are the days of opening the record jacket or CD sleeve and diving into the album. While I knew most, if not all the songs, most of the names escape me because I listen via streaming. I love The War on Drugs. Not yet, unfortunately. They’re performing at the Hollywood Bowl next weekend (130 miles from where I live), but I can’t go. That would be a nice place. Hopefully a better turnout than Portland.